Hiking For Her received this lantern from Fenix, coordinated by Outdoor PR in consideration for review publication. There is no financial relationship between Fenix and Hiking For Her. There is also no financial relationship between Outdoor PR and Hiking For Her. As always, this gear review is being provided in the spirit of helpfulness and the desire to put the best quality gear into your hands. 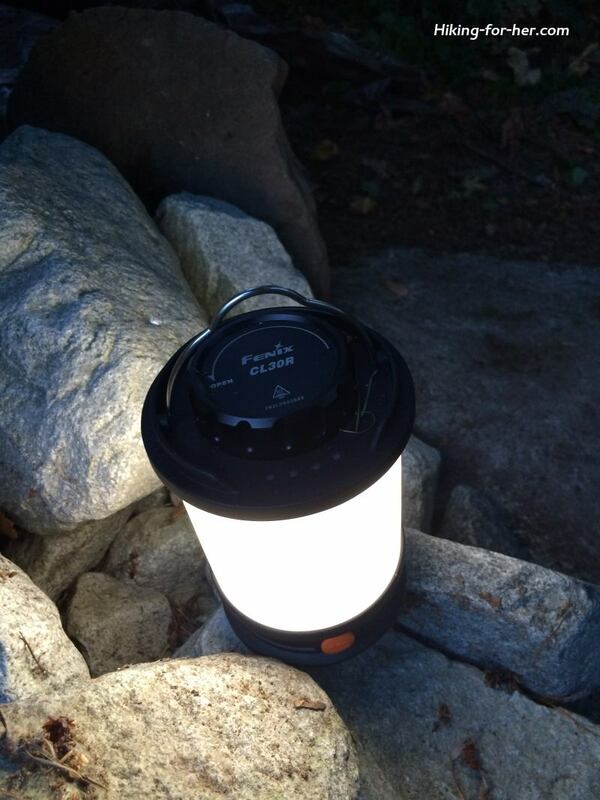 Let's begin by outlining why you might want to take this camping lantern along on your next camping trip. First, it uses between one and three rechargeable batteries. That means you'll keep dead batteries out of the nearest landfill, something that we should all strive to do. 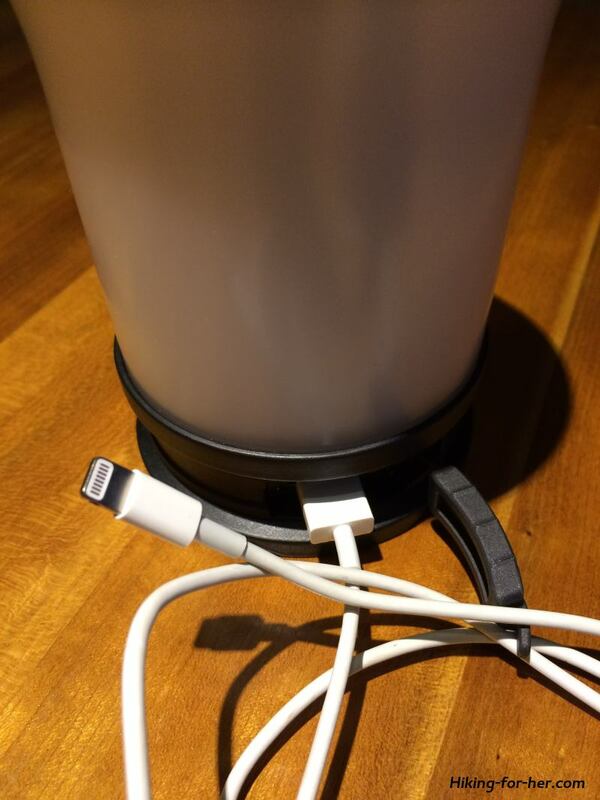 Second, it acts as an independent charging station for other electronic devices. If you're going to be away from electricity for awhile but still need to stay in communication with the outside world (or finish that riveting e-book), this is an important, and unique, feature. Now for the actual reason for bringing along this Fenix lantern: its ability to illuminate your car, tent, al fresco dinner at a picnic table, and more. Maximum output = 650 lumens. For comparison purposes, a 40-watt incandescent light bulb puts out about 450 lumens, while a 60-watt bulb of the same type pumps out about 800 lumens. Lights up an area roughly 115 feet (35 meters) in diameter around itself. That's a lot of space! Gives you six adjustable brightness settings, drawing on power from one, two or all three of the lithium ion rechargeable batteries. Beyond its regular illumination settings, it has two interesting light features. TURBO can be used for activities that need bright lighting, like removing a deep splinter at 3A, maybe? FLASH gives you an instant disco or bear scarer at your camp site! Provides charging and battery-level indicators so you'll never be in the dark about how much juice you've got to work with. A metal lanyard to hang this lantern inside a tent or tarp, or above a cooking area (carabiner not included). 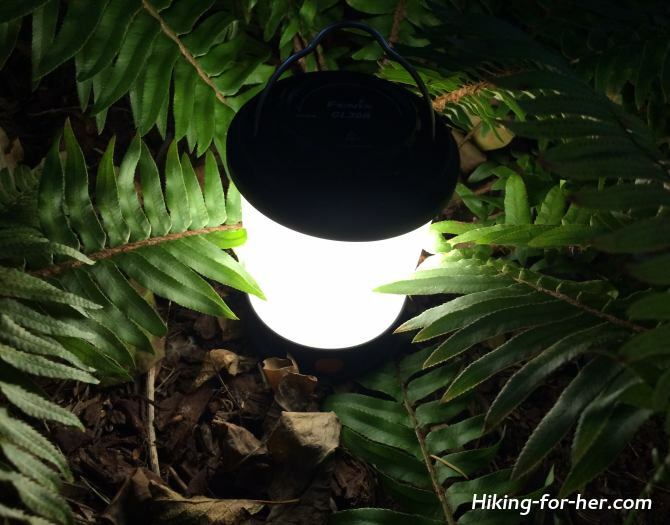 A tripod socket on the bottom of the lantern - a really versatile lighting option for a camping trip. Decent warranty: 5 years repair. Bright orange, textured "on" button (see below) makes it easy to find exactly where to press, and hold briefly, for the desired illumination level. 3 ARB-L18-2600 rechargeable 18650 batteries. This lantern was not designed for backpacking usage, as it weighs nearly a pound (14.5 ounces or 412 grams) before you introduce the batteries. Instead, a car camping trip was used to put this little lantern through its paces. The first thing I noticed: how well built and sturdy the CL30R feels in your hands. This is not made of cheap plastic, so no worries if you (or rowdy children) knock it over! You can hang it from a handy tree limb, using the metal hanging lanyard. You can set it down on a flattish rock or nestle it among vegetation as you clean up at the creek after a long day of hiking. It doesn't get hot, so there are no fire hazards to worry about. There are 6 illumination settings, of which I used only the 3 lowest. The others were WAY TOO BRIGHT for chores and relaxing activities. The softest setting was my mood lighting option, a fine substitute for a campfire during the fire ban season. The third option is really fun: Attach it to your tripod. 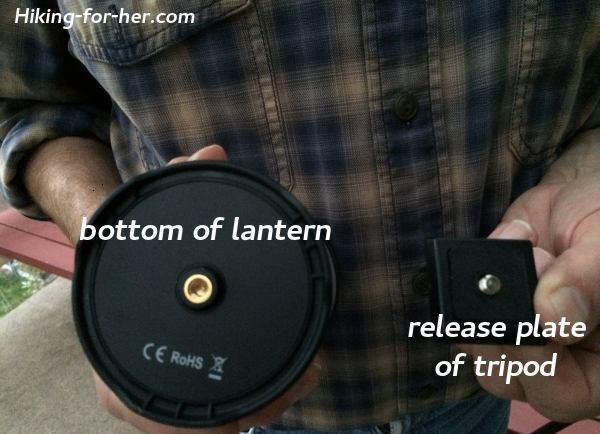 The bottom of the lantern holds a tripod socket, which receives the screw from the quick release plate most tripods have. It only takes a few seconds to secure the Fenix lantern to the tripod, so you can enjoy its illumination at any level required. studying the map, spread out on the car's hood, for the next day's hiking route. Not bad for such a small lantern! I was immediately drawn to the rechargeable feature, and came to appreciate the ability to use the stored power to recharge my portable electronics. 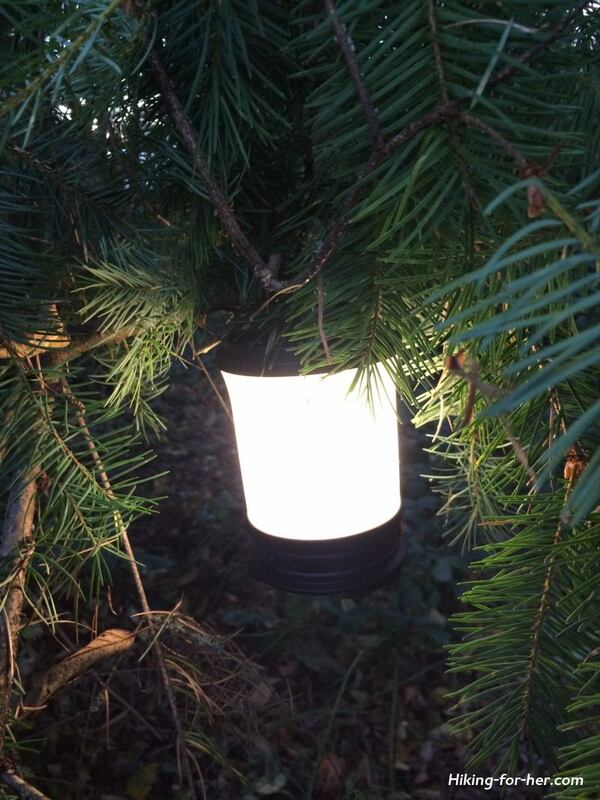 I found the lantern really easy to operate, and while the overnight temperatures didn't dip into the cold range, I can believe that the cold-resistant battery compartment would provide at least three season usage. The light output can be adjusted, ranging from soft and easy on the eyes to eye-poppingly bright. small footprint for such a large contributor to a great camping trip. You will need to remove a little black tag, shaped like a three leaf clover, from the bottom of the battery case before inserting the batteries in the correct position. If you don't remove this tag, the lantern won't work and you'll think you've got a clunker on your hands. Not true! Tighten the lid once the batteries are seated, and give it one extra turn to make sure good contact has been made. Again, the lantern might not work but it's not a defect, the lid is not tightened enough. Don't mix types of batteries. Stick with the recommended rechargeable batteries. And although this is a Fenix camping lantern review, let's think outside the box about uses for this small but powerful lantern. I'll be keeping it on a handy shelf in the pantry for those inevitable power outages that accompany windy weather. I plan to use it to illuminate the backcountry hut I visit for off-the-grid snowshoeing adventures. One of these is on my holiday gift list for a family just beginning to explore the wonderful world of car camping, toddler and new baby in tow. Maybe it will be used as a night light in the tent, or for midnight diaper changes. This company has been around for over 10 years, making precision LED technology and lighting products for us outdoorsy folks. 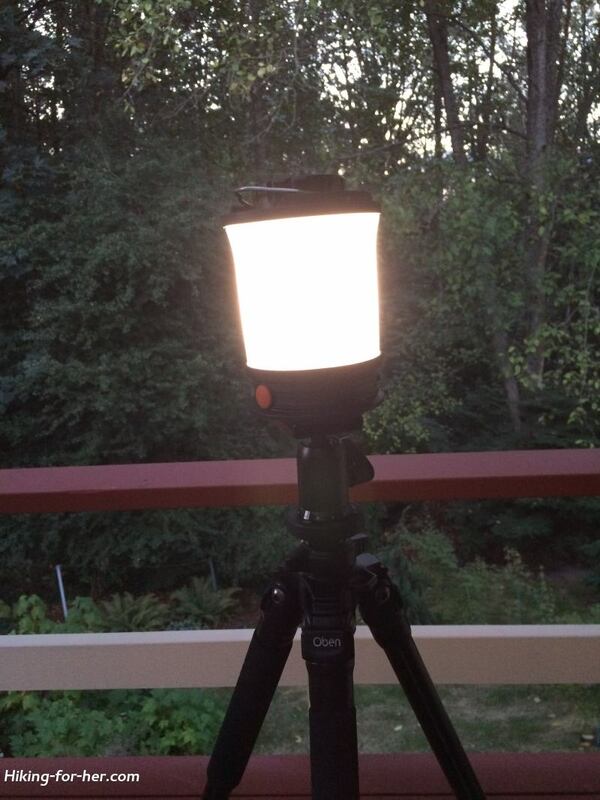 They stand behind their product, which is the final reason I'm happy to recommend this lantern. 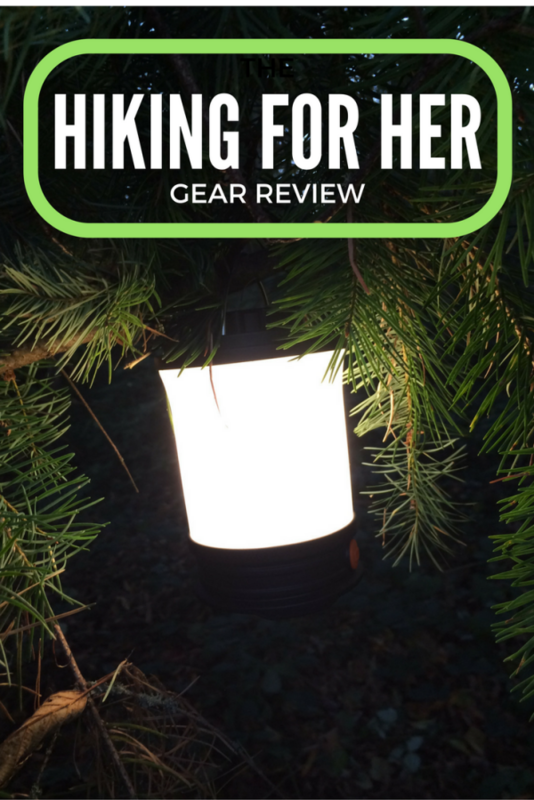 If you need more information about Hiking For Her's experience with this piece of camping gear, don't be shy! Use the CONTACT form at the top left of this page to get in touch. 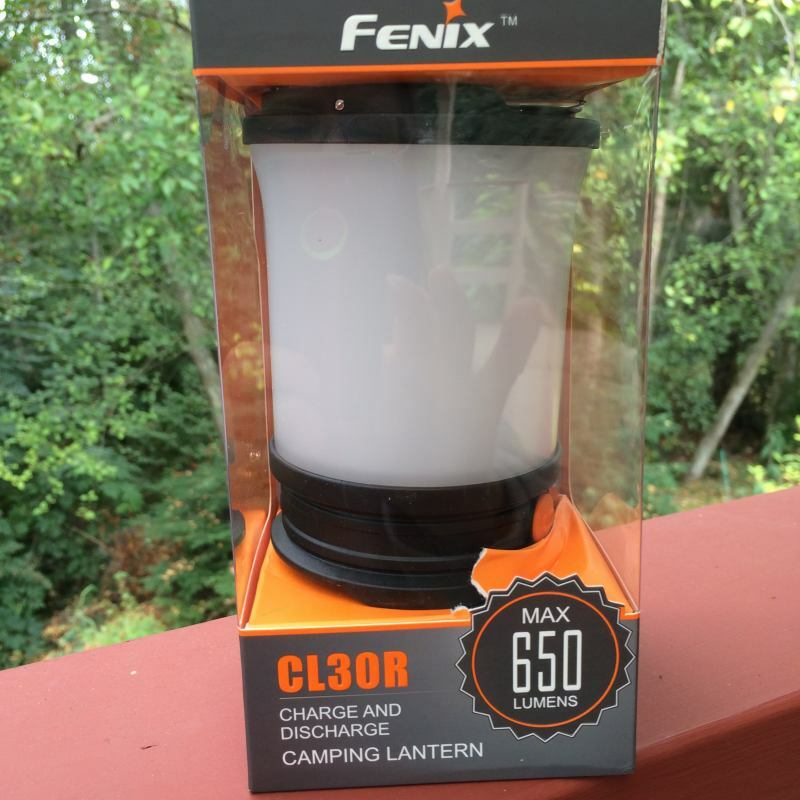 Because that's the whole point of this Fenix camping lantern review: to give you the facts you need, and the opportunity to ask questions, before you head out on your next camping trip. Dare I say "illuminating" facts?